Hand made basketry tends to be in the realm of professional artisans these days, but in the 1950’s it was a home craft like any other. 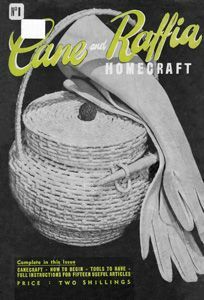 This booklet has a range of patterns for baskets, trays and handbags made from cane and raffia that form a great basis for people who love to up-cycle and create new things from unusual materials. 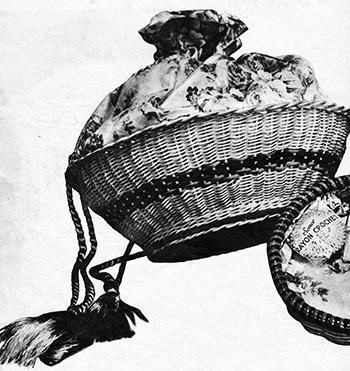 Can you imagine the cute handbag from the cover made from rolled up tubes of newspaper or cast-offs of wire? Why not use the bases of drawers that have been thrown away to cut bases for up-cycled woven projects? This booklet contains many useful techniques and some really lovely patterns to inspire you. Another source of information for up-cycling items into baskets (if you know of any more please let me know!) is Weaving with newspaper, a really amazing Youtube channel featuring many techniques and projects. Copyright Sarah Bradberry, 30th June 2014. All rights reserved.